One of the best memories of my childhood is visiting with my grandparents in Ohio. 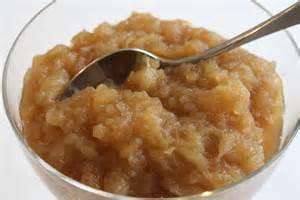 My grandmother, MaMaG, always made the best homemade applesauce and kept it frozen in her storage freezer for a dinnertime side dish. Yes, apples have a lot of sugar but it is the natural kind that your body can break down and use to feed your muscles and cells. The spices used in this recipe give it a healing punch that no store bought applesauce can match. Ginger for anti-inflammatory properties. Cinnamon for heart health. I could go on and on! NO ADDED Sugar needed! I recommend fresh grated ginger (or the puree you can buy in grocery store produce section). Use a few cinnamon sticks and grate them against a fine cheese grater for fresher tasting cinnamon. Nutmeg and cloves can be found in whole form also at most grocery stores and will add a little more taste to your recipe. Throw all ingredients in your crock pot and cook on low for 4-6 hours. Before serving, fold the cooked crock pot ingredients into your blender and puree. Not only will you have a side dish for dinner that night, but your house will smell like you have been burning a scented candle all day! Freeze leftovers for another day in air tight container. This entry was posted in dinners, Nutrition Information, Recipes, snacks and tagged anti-inflammation, apples, fall, Recipes. Bookmark the permalink.